A new lease of life has emerged for a group of Cambodian villagers following the completion of a Healthy Community and Improvement of Agricultural Production Programme on 27 March in Kampong Thom province, 200 km from Siem Reap. This community development initiative, implemented by Mercy Relief (MR), in partnership with the Cambodian Ministry of Rural Development (MRD), provides over 10,500 villagers with improved access to clean water, better sanitation facilities, and enhanced agriculture practices, all of which are critical to the well-being, development and sustainability of the province. Since programme commencement in Jan 2013, 45 Village Health Facilitators (VHF), nominated bv the village chiefs, were trained in Community Total Led Sanitation (CLTS), an integrated approach to achieving and sustaining open defecation free status. These VHFs help the villagers see for themselves that open defecation creates an unpleasant environment. It is then up to the villagers to decide how to deal with the problem. Coupled with sanitation marketing by local latrine suppliers, 450 villagers have since voluntarily constructed latrines, raising the percentage of households owning latrines in the villages from 7% to 31%. Sanitation conditions at Stung Chinit Primary School have also improved, following the renovation of 9 toilet rooms, and construction of a hand-washing facility and water tank. MR is confident that these facilities will enable the school to work towards inculcating good hygiene habits amongst the 600 students. (left) VHFs and villagers get together for a CLTS training workshop session. 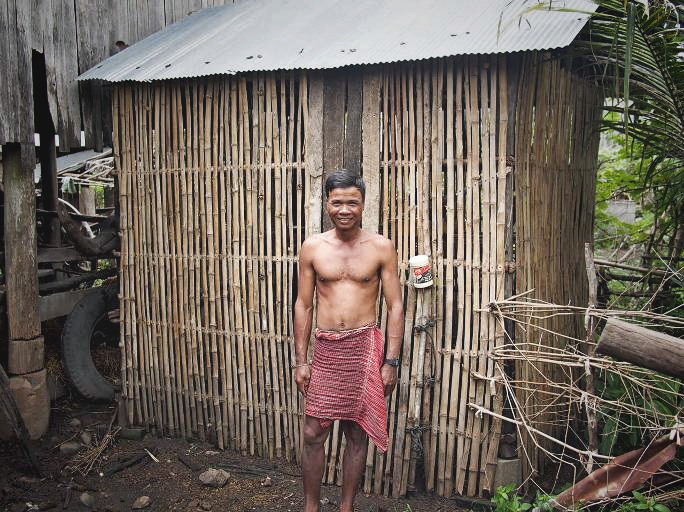 (center) Typical latrine constructed by villagers as a result of CLTS. (right) A student from Stung Chinit Primary School washing her hands at a hand-washing facility constructed by MR.
For the agricultural component of the community development initiative, 24 model farmers were selected to receive training on backyard vegetable farming, crop diversification, animal husbandry and fertilizer composting. A group of Singapore Polytechnic students, volunteering with the Mercy Overseas Volunteers Expedition (MOVE) programme, also played a part in this project by assisting in the construction of 2 integrated posts, comprising a vegetable garden, fish pond, composting shed and chicken coop. To mark the successful completing of the programme, a ceremony, graced by His Excellency Hap Omaly, Under Secretary of State for the Cambodian Ministry of Rural Development (MRD), was held at Balang Commune, Baray District. Also present were government officials, MR staff, and local guests. Costing $142,000, the Healthy Community and Improvement of Agricultural Production Programme, was made possible thanks to funding from members of the Singaporean public. MR, MRD, and government officials at the programme’s completion ceremony. A MOVE volunteer from Singapore Polytechnic shares a few laughs with students from Stung Chinit Primary School following the completion ceremony.